The UK pharmaceutical industry and the aerospace sector could benefit from a hard Brexit, according to a new study. Consultants Bain & Co say the sectors, two of the UK’s most important industries, would benefit from the effects of a hard Brexit, which would entail remaining outside the EU single market and customs union. However a separate poll by Ipsos MORI of UK business leaders has found most believe Brexit is already having a negative impact. The Bain & Co. study assumes that a hard Brexit would result in a further 20% drop in the value of the pound, and a 10% increase in labour costs. A hard Brexit would also mean tariffs being imposed – but World Trade Organisation rules means pharma and the aerospace industry are exempt from these. Bain & Co. predict other sectors would be hit hard – forecasting that the UK automotive sector will go from its current £1 billion profit to a £2 billion loss, with food prices also set to rise sharply. Despite Theresa May’s insistence that the UK wants a ‘clean break’ from the EU, the government is likely to want tariff-free trade with the EU whenever possible. However, the UK prime minister has also indicated that she wants to enforce greater immigration control from Europe. As has been observed many times in recent months, EU leaders won’t be able to grant May both free trade and immigration control, so some momentous compromises and choices will have to be made. Meanwhile, a survey of UK industry leaders has found 58% believe the Brexit vote has already had a negative impact on their business. 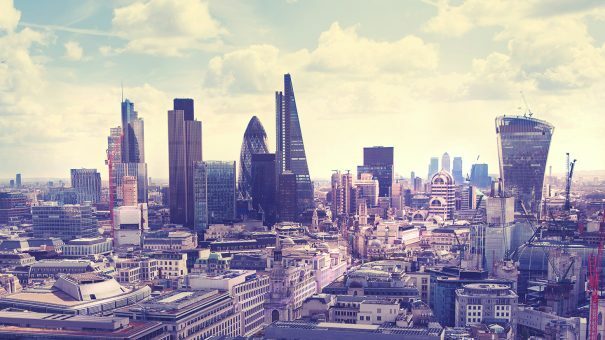 Research firm Ipsos MORI says its survey of over 100 executives from FTSE 500 anticipate a more negative business situation in the next 12 months. Two thirds (66%) feel the business situation of their company will be more negative post Brexit, with only 13% suggesting it will have a positive impact. However, the data suggests that this could improve in the long term, with a third of those interviewed (32%) feeling they would see a positive impact on their business in five years’ time and 45% expected to feel a negative impact. 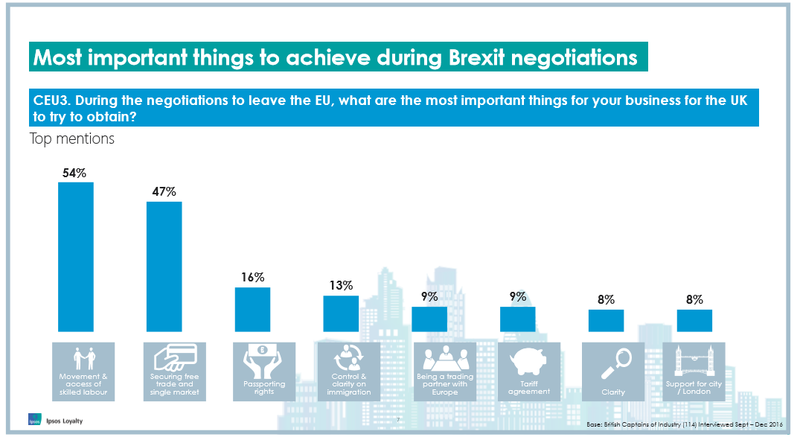 Ipsos says the ‘Captains of Industry’ put movement/access of skilled labour as the number one priority for negotiations with Europe (54% citing it). Behind this were securing free trade/single market (47%), passporting rights (16%), controlled/clarity on immigration (13%), continuing being a trading partner with Europe (9%), tariff agreement (9%). The fact that movement/access of skilled labour came top suggests that UK business leaders have heard Theresa May’s rhetoric around immigration, and fear this will be the political priority in Brexit negotiations, overriding economic considerations. However the survey shows the industry heads were not consumed by gloom. Ben Page, chief executive of Ipsos MORI said while business leaders were not optimistic about the short-term effects, they believed their own companies would find ways to thrive in the new environment. “Businesses are also ready to adapt in order to survive, and thrive, with 96% of business leaders feeling confident that their company can adapt to the consequences of the Brexit outcome,” he concluded. A pharma-specific survey carried out by pharmaphorum in December produced broadly similar results, though a majority of UK pharma leaders predicted that Brexit would cause long term damage to their businesses. 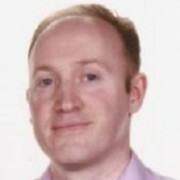 The UK pharma industry is now working with the Office for Life Sciences (a unit shared between the Department of Health and Department for Business, Energy & Industrial Strategy) to develop an industrial strategy for life sciences, which is aimed at boosting the sector through Brexit and beyond.